The Urbane Farmer: CAC article about... AmFam's garden and me! 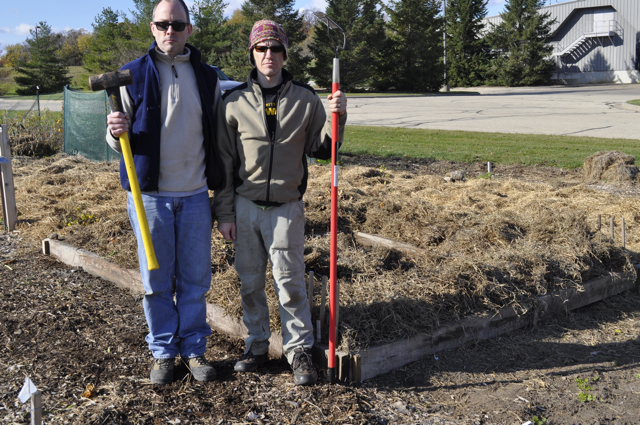 CAC article about... AmFam's garden and me! I got to know a few members of Community Action Coalition (CAC) by reading their articles on the Madison Area Master Gardener listserv, meeting people at the autumn gardener pot luck and at the 2011 Madison "bioneers" conference. My blog caught their attention, and I was interviewed in November for an article in the latest CAC newsletter. Here's a link to the newsletter and the article on page 2 and continuing to page 4. I hope you enjoy reading the article as much as I enjoyed getting to know the fine folks at CAC this year. (CAC) works to develop economic and social capacities of individuals, families and communities to reduce poverty in Dane, Jefferson and Waukesha Counties. One way they do this is by encouraging urban gardening of all shapes and sizes. Very cool Josh, we had a backyard garden in Minneapolis for several years before moving to California, now I would like to construct some raised beds to do some more gardening - the weather is great. Keep doing what makes you happy! I have enjoy your blog while reading. I definitely share your views to my close friends keeps up the good work going.